Poe, a raven, named after Edgar Allan Poe. Since 2009, along with human mascot Poe, Rise and Conquer are Baltimore's two live raven mascots on the sidelines for home games, handled by trainers from The Maryland Zoo in Baltimore. Buffalo Bills Billy Buffalo An 8-foot tall buffalo. 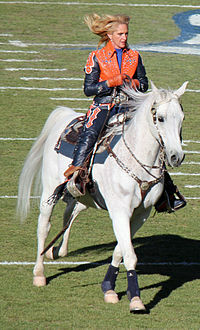 Miles is a white, horse-like anthropomorphic figure wearing an orange jersey; Thunder II is a live Arabian horse. 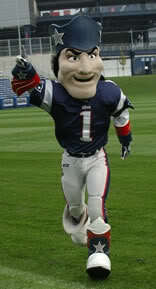 A caricature of a patriot from the American Revolution; named after the nickname of the team's original logo. A burly steelworker with a Bill Cowher-like jutting chin, wearing a hard hat; based on the Steelers' pre-Steelmark logo in the 1950s-early 1960s. A raccoon, the state animal of Tennessee. 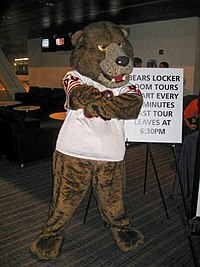 A bear-like figure; named after the team's original name, the Decatur Staleys, as well as Bears founder A. E. Staley. 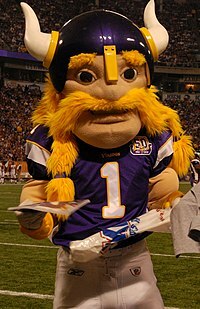 Viktor is a smiling Viking caricature whose head looks similar to the Vikings logo. 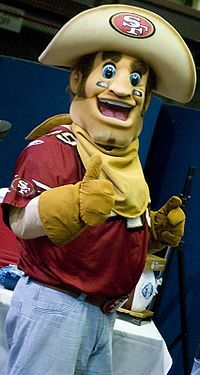 Previously, Ragnar was one of two "human" mascots in professional North American sports (i.e. 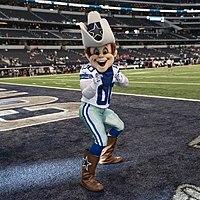 not in any animal or caricature costume), with Lucky the Leprechaun of the Boston Celtics being the other. Ragnar was dressed as a Viking, but in 2015 did not renew his contract. A dog-like figure; apparently named after gumbo, a dish that is very common in the southern part of Louisiana. Swoop is an eagle-like figure. Air Swoop is an air-filled eagle caricature and similar to Swoop appearance-wise. 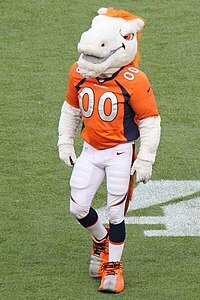 ^ "Broncos', Seahawks' mascots head to Super Bowl".